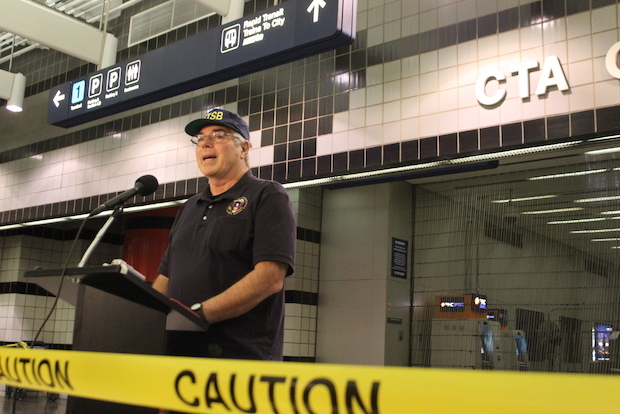 CHICAGO — Investigators probing the Monday morning Blue Line train crash at O'Hare Airport said the automatic emergency brakes on the tracks activated as they were supposed to, and the train was moving at the appropriate speed as it entered the station, leaving open questions about how the train blew past the end of the platform and ended up on top of an escalator. Ted Turpin, investigator for the National Transportation Safety Board, on Tuesday said he could not provide details on what role the train's operator might have played in the crash, and said authorities will interview her at 1 p.m. But Turpin did say the train entered the station at about 25 mph., a safe speed to do so, and at some point automatic emergency brakes were triggered. "It activated. That's all we know factually," Turpin said. "Now whether it did it in time or not, that's an analysis that we have to figure out, and we haven't gone there yet." Investigators were pulling video from more than 44 cameras that captured the crash, which happened just before 3 a.m. Monday and injured 35 people, as well as beginning to pull the maintenance history on the train and the station's tracks. On Monday, a union official said the operator was so tired it appeared she nodded off while driving the train and "wasn't as coherent as she should have been." Robert Kelly, president of Amalgamated Transit Union Local 308, said the operator had worked more overtime than usual in recent days "and she was very tired." Investigators could not comment on that claim as of Tuesday morning. "We always take into consideration a fatigue factor," Turpin said. "We will gather the evidence on that." Reyna Acosta, a Back of the Yards resident who works at the airport, was one of the passengers injured in the crash. "There was a large boom and everyone in my car jerked backwards," the 25-year-old said via email, a day after being released from Swedish Covenant Hospital. "Once someone manually opened the door in our car, we also opened a second one. We saw what had truly happened." On Tuesday, multiple lawsuits were filed in connection with the crash. Dalila Jefferson, a security officer at O'Hare, filed a lawsuit against the CTA, according to a statement from law firm Corboy & Demetrio. Jefferson, who was traveling in the front car, suffered from a broken foot as well as neck and back injuries, according to her lawyer. In another lawsuit, 22-year-old Niakesha Thomas, who works at an airport newsstand, claimed negligence on the part of the CTA in the crash. Officials said the train did have emergency brakes that activate when an operator takes his or her hand off the control handle. Turpin said he would not speculate as to what exactly caused the train to derail. "I can't give you theories today. I'm sorry," Turpin said. Turpin said he hopes the NTSB's investigators will finish examining the crash site Tuesday so CTA crews can begin removing the train. The car that crashed into the escalator will have to be cut and removed in pieces, Turpin said. A spokeswoman for CTA said a timeline for when the cleanup will finish will not be clear until investigators finish with the scene. The O'Hare Blue Line Station will remain closed Tuesday. Blue Line trains will run between the Rosemont and Forest Park stations, according to the CTA. Shuttle buses will be provided at the Rosemont station for riders trying to reach O'Hare, CTA officials said. The Federal Transit Administration and the Regional Transportation Authority are partnering with the NTSB and CTA to investigate Monday's crash.